The remedies won’t come cheap. The choice that CalSTRS financial analysts recommend would boost payments, currently about $6 billion, by $4.5 billion per year, starting next year. That amount, a whopping 75 percent increase per year – would be borne mostly by the state and by K-12 and community college districts, as employers and not by current employees. If adopted by the Legislature, that option – diverting billions of dollars from the classroom into pensions – could dampen, if not dash, districts’ hopes for replenishing their own depleted budgets. Yet that option, which CalSTRS CEO Jack Ehnes is expected to recommend in a cover letter to the report, is the only one that would restore CalSTRS’ defined benefit program to full funding in 30 years, consistent with federal government accounting standards. The median annual benefit for new CalSTRS retirees is $49,000, which represents 60 percent of a member’s final compensation. The average age of retirees is 62. CalSTRS members do not receive Social Security benefits, and most do not receive health benefits from their employers in retirement. 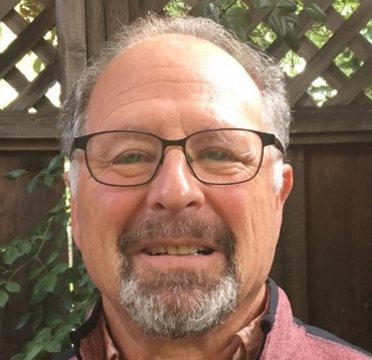 CalSTRS employees hired before Jan. 1, 2013 can retire at 60, receiving 2 percent of their final pay times the number of years they have worked (25 years translates to 50 percent of their final pay). Under the pension reforms adopted last year, new employees will have to wait until age 62 to receive the same benefits. According to the report, benefits that will be paid to future CalSTRS retirees are comparable to what retirees of corporate pension plans receive (for those companies still offering them), once Social Security benefits are included. Anticipating that lawmakers would want to dodge that bullet, however, the 26-page report presents seven other, cheaper alternatives that would fall well short of that 30-year, 100 percent funding goal – by delaying the start of higher contributions by a few years, phasing in increases gradually or aiming for only 80 percent funding. Setting a target of 80 percent of funding over 30 years would lower the contribution increases from 15.1 percent to 12.1 percent, requiring $3.6 billion in annual increases, about $1 billion less, split among districts and the state. Another option is to stretch out the goal of full funding to 75 years. But even that target would still cost $2.9 billion more in yearly payments into the pension system while leaving CalSTRS only 62 percent funded after 30 years. That option also would saddle additional generations of state taxpayers and teachers with decades more of higher payments. One alternative not presented is to do nothing. 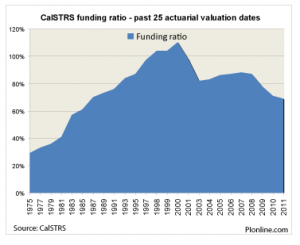 CalSTRS would then gradually deplete its assets and go broke in 2046. At that point, it would convert to a pay-as-you-go pension system, requiring contributions equaling 50 percent of an employee’s pay, according to the report. Next to CalPERS, which serves other state and local public employees, CalSTRS is the state’s second largest pension system. It’s still recovering from the 2008 plunge in real estate values and the stock market slide that wiped out 25 percent of the value of the portfolio for CalSTRS’ defined benefit program and has left it only 69 percent funded to meet its long-term obligations; liabilities to current and future retirees exceeded assets by $64 billion. That was as of June 30, 2011, the most recent year that the CalSTRS board has to act on. Reflecting recent gains in the stock market, however, CalSTRS had an impressive 13.5 percent rate of return for the year ending Dec. 31, 2012. The value of its assets – $157.8 billion on Dec. 31 – edged closer to its high point of $172 billion in 2007. However, recent gains don’t make up for years of lost earnings. Had the target annual return on assets of 7.5 percent been met since 2000, CalSTRS would be more than fully funded. Instead, the report notes, it would now take five straight years with a 17 percent return on assets, followed by 25 years of hitting the earnings goal of 7.5 percent annually, to reach full funding without the need for additional payments into the system – an implausible scenario. Last year, at Brown’s urging, the Legislature passed a package of public employee pension reforms. But because reduced pension benefits will affect only employees hired after Jan. 1, 2013, nearly all of the savings to the system won’t be felt for decades, and won’t reduce the need to deal now with CalSTRS’ deficit. Under this option, which CalSTRS actuaries would discourage the Legislature from adopting, the goal would be only 80 percent fully funding the pension program in 75 years, not 100 percent funding in 30 years, by adding incremental contributions of only 1.5 percent of an employee’s pay per year, leveling out at 11.3 percent more. But at the end of 30 years, the program would be only 55 percent funded, leaving it more vulnerable to stock market swings. Source: CalSTRS (Click for a clearer image). CalSTRS has relied on gains in investments to meet 58 percent of the obligations paid out to retirees and on contributions from teachers, K-12 and community college districts and the state for the other 42 percent. Unlike the CalPERS board, which can adjust the amount that government employers have to pay into the system – and already has ratcheted rates upward – CalSTRS must rely on the Legislature to set contribution levels. Payments into the system currently total 21.45 percent of a teacher’s or administrator’s pay, split three ways. The state pays 5.2 percent. To reach full funding in 30 years would require additional contributions of 15.1 percent of pay by some combination of the employee, the school district and the state, bringing in $4.5 billion to the system, as of July 1, 2014. But here’s the rub: The Legislature could make new school employees share the increase, but courts have ruled that the Legislature can’t increase the contribution rates of current school employees without giving them a benefit equal to the value of their increased contribution, like higher pay. The result: The state, through the General Fund, and districts will have to absorb most of any increase in contribution levels. The report suggests that there may be a way, by deft legal maneuvering, to increase employee contributions by a maximum 2.6 percentage points. One important, unresolved question is whether higher CalSTRS contributions by districts would require the Legislature to increase Proposition 98 funding for K-12 and community colleges by an equal amount. A 2006 opinion by the Attorney General’s office said no; the Legislative Counsel disagreed, according to the report. Without an increase in Proposition 98 funding, districts would have to absorb higher pension costs within their existing budgets. Each percentage point increase in contributions would cost the General Fund or districts about $300 million, according to the report. During their discussion of the report last Friday, some board members expressed reluctance to even offer options that clearly would not get CalSTRS to full funding, like the 75 year payback period or raising contributions less than a percentage point per year or just enough to push back insolvency a few years. Regardless of what the Legislature does now, it will have to adjust CalSTRS’ contributions periodically, because there will be years when the system exceeds its projected rate of return, and years, like 2008, when it falls drastically short. “One idea that has been suggested to reduce DB Program liabilities for future members is to require they participate in Social Security for their public education service, and reduce the benefits paid under the DB Program. There is no notion of “vesting” in Social Security. Vesting means gaining an irrevocable and individual right. Social Security participants become eligible for disability and retirement benefits after they accumulate enough quarters of covered employment, but these benefits never really belong to the individuals in question; the benefits can be changed at any time, by legislation. Worse yet, while pension plans like STRS are at least nominally funded (money is accumulated to offset the cost of future benefits), Social Security operates on a pay-as-you-go basis (current Social Security taxes are received, current Social Security benefits are paid, the surplus is spent immediately on general government expenses, and a completely imaginary IOU is written). The retirement benefit ceiling for Social Security is far too low to replace the earned income of an educated professional — even a teacher, whose lifetime annual average salary falls below the professional range. I agree that public-sector pension plans like STRS lock in 50-something employees. Again, this saves the public money. On a typical salary scale, and given a typical entry age, most 50-something teachers will have reached the maximum salary step. They will see no further salary growth (other than inflationary cost of living increases, in districts where these are still given). Where private-sector employees in their 50s can compete for performance-based pay increases and for promotions, and have the potential to maintain their salaries if they switch employers, teachers are locked in to the final salary step for years and cannot hope to maintain their salaries if they switch districts (districts limit the number of years of experience credit that can be transferred for salary placement purposes). The public gets additional years of service without providing real pay increases. You may be on to something, RW. See the last paragraph of page 19 of the report. I believe it refers to the Defined Benefit Supplement Program and provides the rationale to charge employees the 2.6 percent extra that my post mentioned. It is quite clear from the report that the DBS John refers to, currently at 2% per annum, can be reduced and/or can result in higher current member contributions. This is, of course, akin to “adjusting” the way Social Security increases could be calculated downward by redefining how the “consumer price index” is set. And so the secure retirements of the 99% are under threat so that the narrow interests of the 1% and corporations can be protected. The better solution, again in the report, is to raise employer contributions which would trigger a Prop 98 increase in school funding. This would bring CA some small way towards moving out of what ED Week recently, and miserably, calculated as this state’s being 49th of the 50 states in per pupil funding for K-12 education. I say “small way” because, as the report also makes clear, the DBS program is relatively insignificant compared to the DB program. This makes combining the state’s percentage contributions to the DB and DBS program problematic (to say the least). The keys to understanding the funding issue are the state’s continued decreasing contributions to the DB and the economic instability caused by financial market malfeasance. el, the incentive that you mention saves the public a fortune, in the context of newer policies and practices in K-12 personnel management. Teachers who leave during their first five years (most do, according to the oft-repeated figure; even if the figure is exaggerated, the fraction of “leavers” is substantial) do not vest in STRS. While they may withdraw their contributions (8% of salary), they forfeit all school district (8.25%) and state (5.2%) contributions (percentages as stated in the article; I’m wondering whether the 5.2% includes previously committed payments toward the unfunded liability; I seem to remember a lower state contribution rate). Combined with PKS layoffs, non-reelection, and abuse of the temporary and substitute classifications, the five-year vesting window gives school districts time-limited access to cheap labor. In a year, or two, or three, those teachers are replaced with other newcomers, and are left without any employer-paid retirement contributions, let alone any Social Security credits. On the question of allowing transfers between Social Security and STRS, this would be legally and financially difficult, as Social Security is the granddaddy of defined benefit arrangements: there is an extremely weak relationship between individual contributions and individual benefits. Social Security benefits never vest and can be changed or canceled at any time by legislation. For teachers, at least, STRS is a more reliable option. One of the disadvantages I see with the separate STRS system is on the other end, where you have teachers in the 50+ age range who are having health issues or are just ready for different kinds of challenges and are not enjoying teaching as they once did. For these teachers, there is already a big investment in STRS, but not enough for their retirement; there’s also not time to vest properly in Social Security. Perhaps they could continue to contribute to STRS if they were nearly vested instead of Social Security (of course, the rates for STRS are higher; the person would have to kick out more cash). My concern is that ends up being an artificial incentive to stay in the wrong job that doesn’t actually benefit the employer or the employee. That’s true, but I would argue the whole point of any type of compensation that needs to vest is retention. Our blunt force policies generally are not subtle enough to allow distinguishing that goal from the goal of what’s best for the educational system. Note that if administrators do their jobs and maintain quality educators while removing those that are not, then those two goals can be more likely to be aligned. I think it’s always going to be difficult to try to align two different vesting systems for late-in-life employees unless we actually make that a priority. Quote from the STRS website. That’s a bit different from the 5.25 state contribution John mentions above. To Mr. E. Dogfood above: Take care, all that foaming at the mouth will eventually gum up your keyboard. Gary: The state makes contributions to CalSTRS in two ways. One is the rate it pays to the defined benefit program, now 2.791 percent. The other is 2.5 percent to the Supplemental Benefit Maintenance Account, basically a cost of living program that keeps the pensions of CalSTRS recipients from falling below 85 percent of their original purchasing power. The two combined equal 5.29 percent, as you can see on page 12 of the report. That’s an interesting way of “defining” contributions. Like a bank that pays 2% on your savings account of $30K and 3% on your checking account balance of $1K. Yikes! It’s a combined 5%. The fact is, the state of CA took a “pension holiday,” as did many other entities that contributed to the current funding issues of many retirement systems, state, county, and municipal. Of course it must never be denied that retirement systems, like the nation’s entire economy, are subject to a “manufactured crisis” created by the greedy, reckless, and unregulated behavior of the financial sector. STRS can provide for the funding of retirements at 80% of full funding quite nicely. It can do this by having the state pay its full share and employers and employees ratchet up contributions very gradually while simultaneously taking into account the changes in investment income as the economy improves. It would be nice to see CalSTRS consider making up for some of the potential shortfall by allowing us to choose to pay into Social Security. Also, could there be a way of restructuring STRS so that it is not considered a Social Security replacement that falls under the Social Security windfall penalty. I entered the STRS system late, so I won’t have a wonderful pension, but I worked many years where I paid a lot of money into Social Security. With both a low pension and resuced Social Security, I got the short end of the stick. Please note that those of us in Community Colleges have advanced degrees (PhD’s) which on average are earned at the age of 35. If you got a job right out of the university, you would only have 30 years into the pension when you were of retirement age. It would be a nice combination to collect your full entitlement to social security and STRS. This way a reduction could be compensated for. I don’t think it helps with “saving STRS” but I think it would be good policy to figure out a way for people to roll some amount of credit from Social Security into STRS or STRS into Social Security. The STRS formula is meant to assure and encourage people to spend their entire careers as educators… and I’m not sure we want to use the pension to incentivize in that way any longer.